In our last couple of posts about heavy machine guns, we saw that they were weapons designed to fire rifle cartridges for long periods of time. Since they were designed for firing in automatic mode for hours, the designs were bulky and the early machine guns were water-cooled, which contributed even more to the weight. Therefore, these weapons needed multiple people to operate effectively and inconvenient to move around and were mainly used as defensive weapons. Heavy machine guns of this type were used extensively in the trench warfare conditions of World War I, against enemy infantry. World War I also saw the introduction of armored vehicles, such as the British Mark-I tank and the German Junkers J.I airplane. Against such armor, ordinary infantry rifle ammunition (like the .30-06) was useless. Therefore, there was a need for a weapon that could defeat lightly armored vehicles, buildings, aircraft etc. and could do so at longer ranges. In 1917, General Pershing posted a request back to the US Army Ordnance Department, asking for a rifle to be designed, that could fire a bullet of at least .50 inches (12.7 mm.) diameter at a velocity greater than 2700 feet/second (820 meters/second). The famed designer, John Browning, went to work on this request. He took his earlier .30 caliber machine gun model and scaled it up to fire a .50 BMG (12.7x99 mm.) caliber cartridge. His initial design used water cooling, just like other heavy machine guns of that era. The design came too late to be used in World War I, but was accepted later by the US Army and Navy as the M1921 (curiously though, despite the name, it actually went into production in 1929!). After Mr. Browning passed away in 1926, further development work on this gun went on, led by Dr. S.H. Green. By studying the needs of the US Army, Navy and Air Force, Dr. Green realized that a single machine gun model could not accommodate everyone's requirements. Hence, he redesigned the M1921 to a model that could be changed into seven different .50 caliber machine guns, all using a common receiver component, but switching the other components such as the barrel, water jacket etc. The new model machine gun was called the M2 heavy machine gun and was manufactured in its different versions by Colt, starting in 1933. One of the versions did not have a water jacket, but instead had a heavier air cooled barrel, which was designed to be quickly changed. The lack of the water jacket meant that the barrel had to have a larger surface area and have more mass to compensate, therefore this variant was called the M2 HB (HB standing for "Heavy Barrel"). However, this version was lighter compared to the water-cooled versions: the water-cooled M2 versions weigh about 121 lbs (55 kg.) and the air-cooled M2 HB only weighs 84 lbs (38 kg.) in comparison. Another even lighter version, with a thinner barrel designed exclusively for aircraft use, only weighs 60 lbs (27 kg.) and was used by many US aircraft in World War II. It must be noted that World War II changed the nature of warfare in several ways. The German Blitzkrieg strategies showed the effectiveness of maneuver warfare and static machine gun positions that were so effective until World War I, became obsolete and useless. In this environment, a lighter heavy machine gun model that can be moved around relatively easily, is much more useful than a heavier water cooled model. M2 Heavy Machine Gun on a M3 tripod. Public domain image. While the M2 HB weighs 84 lbs. (38 kg. ), it must be noted that the M3 tripod stand that it is mounted on weighs an additional 44 lbs. (20 kg.). The gun is also designed to be mounted on jeeps, armored vehicles, ships or anti-aircraft turrets. It can fire a variety of rounds, ranging from standard ball ammunition to armor piercing, incendiary etc. This weapon was very successfully used by various branches of the US military in World War II and continues to be used by the US military to this day. It is also used by military forces of many other countries in the world. It exemplifies the modern definition of the heavy machine gun, as we know it today. To summarize, the early heavy machine guns were designed to use standard rifle ammunition, were water cooled and bulky, capable of long range firing, and designed to be used in static defensive roles. The modern definition of a heavy machine gun is a weapon that is designed to use much larger ammunition calibers, is air-cooled, has quick change barrels to solve overheating issues, is less bulky than water-cooled models, capable of long range firing, is designed to be moved around relatively easily, and can be used in both defensive and offensive roles. Modern heavy machine guns are designed to be used, not only by infantry, but also by jeeps, tanks, humvees, boats, ships, aircraft etc. 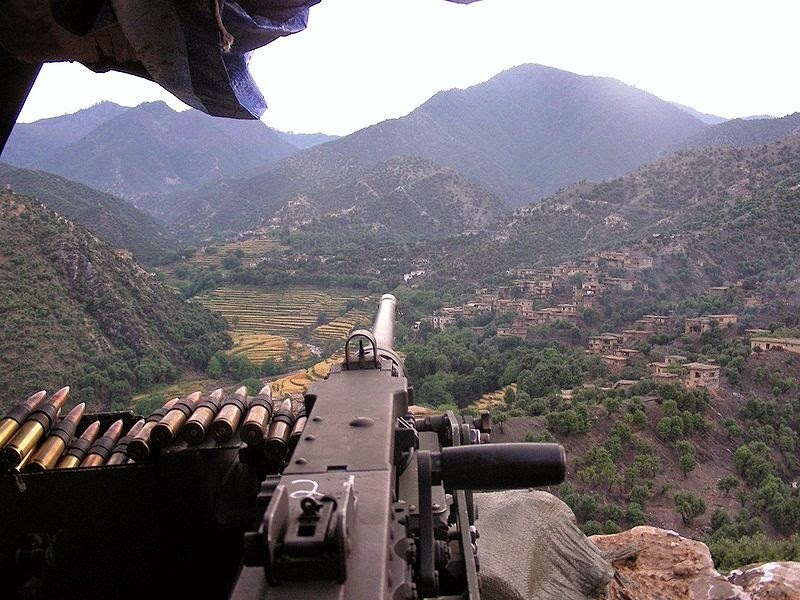 A M2 HMG in a firebase overlooking the Korengal valley in Afghanistan. Click on the image to enlarge. Public domain image. 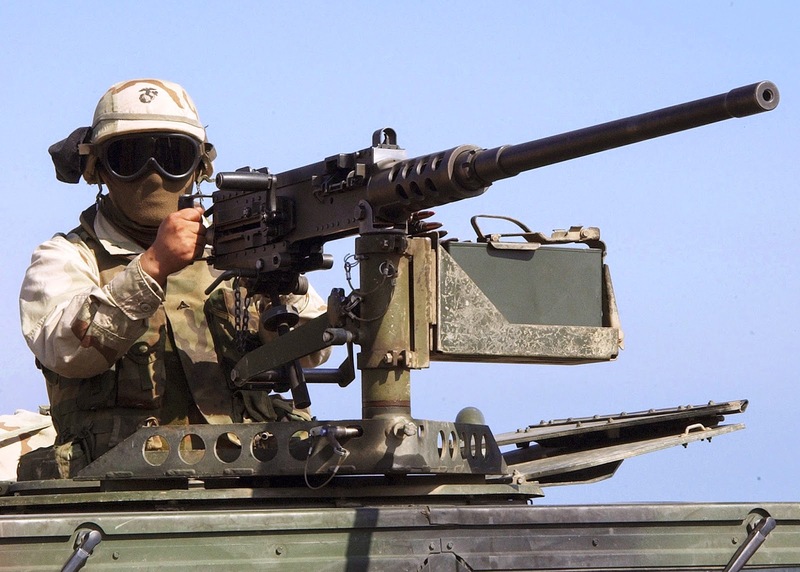 US Marine from the 24th Marine Expeditionary Unit with a vehicle mounted M2 heavy machine gun. Modern heavy machine guns include the above mentioned M2, the Soviet DShK 1938 (another World War II era design), the Russian Kord HMG etc. It is worth mentioning that not only M1921 was made by scaling up M1917, the cartridge (12.7x99mm or.50BMG) was scaled up as well - it is based on the .30-06.